You know how Donny and Marie are a little bit country and a little bit rock and roll? 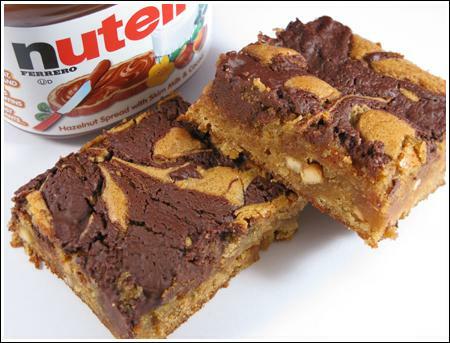 Well, Marbled Peanut Butter & Nutella bars are a little bit European and a little bit American. The base is a peanut butter brownie and the swirl is made from dark chocolate, Nutella and butter. For a richer hazelnut flavor, use a hazelnut flavored dark chocolate bar. Green & Black’s dark chocolate with hazelnuts & currants would work (if you don’t mind a few currants) or you could use a dark chocolate hazelnut flavored Ritter Sports Square. They have a pretty intense hazelnut flavor. P.S. Don’t forget to let them cool completely. Chilling gives them a better texture, but you can serve them at room temperature (or cold, if you like cold brownies). P.P.S. I’m sorry about the Donny and Marie joke. I’m alone and I’ve had too much coffee. Preheat oven to 350 degrees. Line an 8 inch square metal pan with non-stick foil or line with regular foil and grease the foil. In a mixing bowl, using medium speed and high speed of an electric mixer, beat butter and brown sugar until soft. Beat in vanilla and peanut butter, then add eggs and beat just until mixed in. Scrape sides of bowl and beat in baking powder and salt, making sure they are evenly distributed; Add flour and stir until it is mixed in. Spread peanut butter batter in pan. Make swirl mixture. Melt chocolate and butter in a small microwave-safe bowl at 50% power. Alternatively, you may use a double boiler or bowl set over a pot of barely simmer water. Remove melted chocolate from heat and stir in Nutella. Drop spoonfuls of Nutella mixture over peanut butter brownie batter and drag a knife through to make a marbled pattern. Bake on center rack for 30 minutes or until brownies begin to pull away from the side of the pan and center seems set. Cool pan on a wire rack. When brownies hit room temperature, chill them for an hour or so. Lift from pan and cut into squares. Peanut butter and Nutella is a perfect combination. I have to try them! Hope you enjoy them, Sandra! How are those TK chocolate chip cookies coming along? I’m waiting for another review ;). these are in the oven as i write this. they smell AMAZING, the batter was to die for, and i cannot wait to try them once they chill….if i can wait…. these have been at the top of my must bake list forever and i am so glad i finally got to it. thank you for the joy of your recipes!!! Ella, thanks so much for the review. I’m glad you liked them. What will we call your religion? These are beyond words amazing. The moment I saw this I knew I had to try it, and it turned out even better than I expected. I love these so much I could form a religion around them. I made a batch of these yesterday and I really liked them (tasted better on the second day!). I used creamy Jif instead of crunchy (had some leftover from some peanut butter & jelly cupcakes I made). I think they would taste even better with crunchy peanut butter for texture and I will probably reserve some of the brownie batter to drop on top before marbling (some of my nutella blended together). Also, random side note: I tried marbling nutella into a batch of vanilla cupcakes once before baking. It didn’t work out as planned b/c the nutella was too dense and sank to the bottom. I will stick to piping nutella into the center for the time being! I just got home from the grocery store and now I have NUTELLA! 🙂 Gotta try these. I bought the Nutella just for these brownies. I HAVE to make these right now! Nick, I think the glass pan might be causing problems. You can still use it, but the rule of thumb (from what I’ve read) is to reduce the heat by 25 degrees. Based on the other things you’ve said, you should probably keep using the Jif Natural. Sounds like it works! The problems all seem to lie with the glass pan and/or slight overcooking. Flour may or may not be an issue. Like I said, I use 4.5 oz because when I scoop, I get 5.1 oz…but I’m a heavy scooper! Thank you so much. Well I have to say the last batch I made I loved them but not on the 2nd day. Now everyone in my family loves them and so do my co-workers but they are easy to impress. But I am going to try your recipe. I am using a glass pan so I’ll try the lower temp. And as for the flour I’m just scooping it out and puting it in. I’ll try weighing it next time. I also am using Jif Natual. I love that stuff. I think my problem is Im not letting them cool long enough and im probable cooking them for to long. Usually the first time I take them out to check on them I think man these don’t look ready and I end up putting them back in. This is in response to a comment Nick made about these brownies. He mentioned they turned out great the first time, but dried out. So if anyone is having issues, here are some thoughts. #1. It might be that you just don’t like them or were expecting something different. This happens to me all the time! But I’ve already got two emails from people who made them and loved them. #2. The peanut butter part should be dense and moist with a crusty top while the nutella part should be firm but moist (not too dry). #3. Are you baking in a glass pan? If so, that means you need to reduce the heat by 25 degrees. Even if you are not baking in a glass pan, if your brownies are coming out dry you should probably try a lower heat and a slower time — like 325 for 40-45 minutes. #4. When you pull the brownies out, the center should be slightly shaky. As the brownies cool, they’ll cook internally and you’ll have a delicious dense and moist texture. #5. How are you measuring your flour? If you are scooping and sweeping, you are probabyl using more flour than I use. I gently spoon and sweep or I weigh 4.5 oz for every cup. #5. What kind of peanut butter are you using? I’m using Jif. At any rate, feel free to improvise! I’m certain the Nutella swirl would work with just about any peanut butter brownie recipe, so if you find a better one, go for it. Julie, I don’t think Frangelica would do anything for the swirl. If you can find it, you could try hazelnut extract. However, I think you’ll be able to find some sort of hazelnut chocolate……or you could just use some plain chopped hazelnuts. I don’t find Nutella to have a strong hazelnut flavor. To me, it seems a bit sweet. I like it, though. One more thought. If you can find it, some hazelnut butter might be good swirled into the chocolate. This is sheer genius. Up until now my favorite way to eat nutella was spread on a croissant. I really must expand my horizons. Ingenious! I have to admit, I’ve only eaten Nutella a couple of times (yes, total…in life), but I think this combination sounds delicious. I can’t wait to try it! Looks so awesome! And they photographed awfully well too. Do you think it would work to add some frangelico to the swirl to get more hazelnut flavor? Or would it mess up the chocolate? If I can find some hazelnut flavored chocolate (without currants–I’m not one to mix choc. and fruit), i’ll try these for sure. These look super yummy, Anna – I love the marbled effect! Wow, those look amazing, I bet they taste that way too. This site is total cookie p*rn and I love it! Let us know how the 13×9 inch pan works! I’m sure a lot of people will want to double the recipe. Sarah, the good news is, this won’t use ALL of your new Nutella. Melanie, I made an 8 inch pan and cut 9 huge brownies. You could cut them smaller and get 12. The yield really depends on how big you want to make them. These look very rich and delicious! I might make them for a meeting I have on Friday — what is the yield? Just bought a jar of nutella! Can’t wait to try these. They look amazing! They are in the oven! I cannot wait! I doubled it because I have to take treats to send home with 4 teachers. And I’m having a brunch here on Friday, so if there are any left they will go there! Oh, wow. They look and sound fabulous! Oh my goodness. My favorite condiments put together! Those look so good! I love your recipes, they are always something me and my family would enjoy!! Ummmm, yes please! Those look yummy! I didn’t have the Donnie & Marie paper dolls, but at some point, I had the Donnie & Marie barbie dolls with the purple costumes. We have a pretty tight neighborhood crime watch going on right now, so breaking in is not a good idea. I’ll save you a couple. They’re better on Day 2. 1) One of my favorite toys as a kid was a set of Donnie and Marie paper dolls. I would kill to still have my little shoe box full of them and their clothes! 2) If these were in your house when I was there this afternoon, and I didn’t get one … I’m driving back over tonight and breaking in. Made the brownies for my family and they were a big hit. Thank you. Joe’s look good! There’s also a version on Food TV. However, I wanted the Nutella separate from the peanut butter so I did the marbling. hi anna! i love that you just made these! i just tried joe’s (culinary in the country) recipe for peanut butter nutella brownies yesterday. they were fabulous! you really can’t go wrong with peanut butter and nutella!!! We were visiting my stepson and family last weekend. They called me in to see a recipe being made on a Food TV show (don’t know which one) – brownies frosted with Nutella then sprinkled with chocolate chips and nuts. The next day when we got back to their house for a family dinner, they had made the brownies for dessert!!! I may have to make this recipe for them when they visit us at the end of the month. Cathy, thanks for the nice comment. I used Jif Crunchy. I also buy natural peanut butter, but I tend to use Jif for most of my baking. If I use natural, I’ll note it. The default is Jif. What kind of peanut butter are you using for these brownies? Do you think natural peanut butter would be ok or should I use regular peanut butter? I’ve made several of your recipes and all have gotten rave reviews from my friends and neighbors. Thanks for sharing them with the cookie lovers of the world! Carrie, I think it might be too much chocolate, but you can try it anyway. I’m wrong a lot. Darn it! I just banned myself from any more baking. (I had just made the Pillsbury Bake-Off Cookies and two (yes, two) batches of the no fail bar cookies. (OMG. I ate one pan myself.) Now I see these brownies and need to try them! Anna – do you think mini chocolate chips in the pb batter would work? Or do you think that would be too sweet? Ooooooooooh. Back in the day, I ate Nutella like a champion. How sad to discover this recipe too late! Those brownies SCREAM decadence – yum! I am not even a brownie person, but I think I just fell in love with you. Must. Try. Now. These look amazing. I am a Nutella fanatic! Can’t wait to give ’em a go.